Azure Availability Zones support for Service Bus Premium provides an industry-leading, financially-backed SLA with fault-isolated locations within an Azure region, providing redundant power, cooling, and networking. This preview begins with Central US, East US 2, and France Central. This feature adds even more resiliency and fault tolerance capabilities to organizations in Finance, Healthcare, Retail, or other verticals that handle sensitive mission-critical data and transactions that simply cannot be lost or significantly impacted when using cloud messaging services. Also, support for Availability Zones (AZ) combined with disaster recovery features offers high availability and fault tolerance that can withstand zone and regional outages. Availability Zone support for Service Bus takes another step in the direction of keeping to our commitments in making sure customer cloud messaging between applications and services run as smoothly as possible. What regions will this be offered in during preview? Support for additional regions will be offered soon. Learn more about Availability Zones. How can you enable AZ on your Service Bus premium namespace? 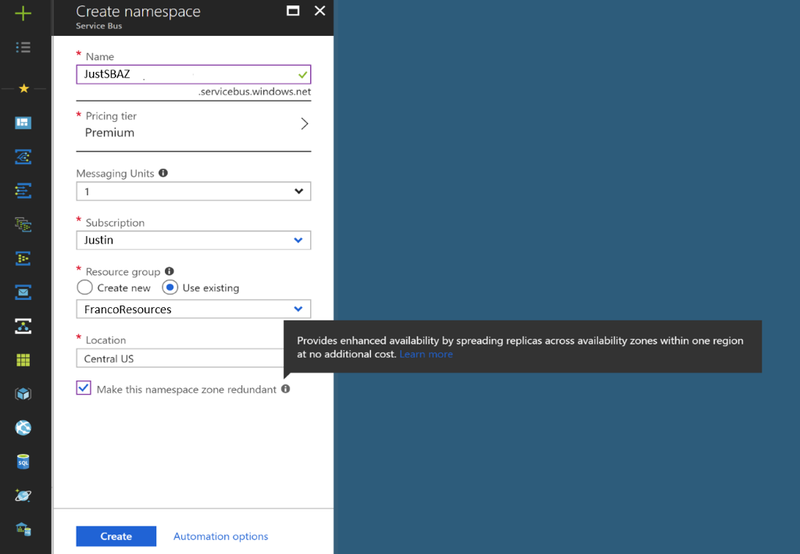 You can enable Availability Zones on new namespaces only, we do not support migration of existing namespaces. You can also enable zone-redundancy by creating a new namespace in the portal as shown below. It’s important to note that you cannot disable zone redundancy after enabling it on your namespace. Learn more about Azure Service Bus.